Venice bloomed like La Traviata's Violetta on her deathbed, with a revival of talent to ease her political decline. Someone once called the 18th century the ‘vegetable period’ in art, but if everyone else made turnips, Venice created a charming, elegant stylish ratatouille that became the international fashion of its day. The transition to iridescent light and graceful forms began with Sebastiano Ricci of Belluno, in his ceiling of San Marciliano (San Marziale). His foil was Giambattista Piazzetta, who disdained colour for chiaroscuro and dramatic zigzagging compositions. 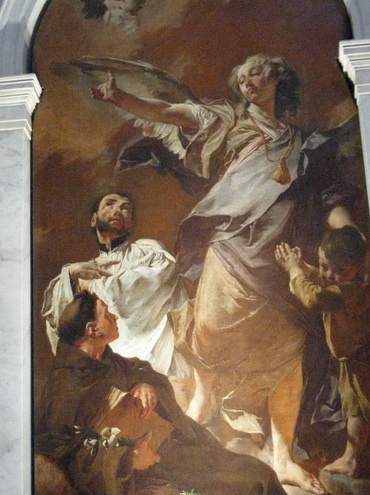 Both proved fertile inspiration for the celebrity decorator of the Rococo era, Giambattista Tiepolo, a virtuoso master of theatrical, buoyant ceilings, narrative, heroic frescoes set in illusionist (quadrata) backgrounds (as in the Palazzo Labia) and dazzling altarpieces (Sant’Alvise). He often worked with his son Giandomenico Tiepolo, who had no heart to continue his father’s heroic style, but instead painted some highly original genre scenes (as in Ca’ Rezzonico). This was also the period of the precise Antonio Canaletto and the more impressionistic brothers Francesco and Gian Antonio Guardi, whose countless views of Venice were the rage among travellers on the Grand Tour; even today the majority of their works are in Britain and France. Equally popular was Rosalba Carriera, whose flattering Rococo pastel portraits were sold well among Europe’s nobility. Another painter of the era, Pietro Longhi, devoted himself to genre scenes that are most interesting as a documentary of Venice 200 years ago. Meanwhile, Venetian architect Giorgio Massari translated their Rococo sensibility into stone, especially in the lovely church/concert hall of La Pietà, while architect/sculptor Domenico Rossi defied gravity and reason for the Jesuits at the Gesuiti church, and in his ornate façade for San Stae. One of the most memorable figures of the early 1700s was a furniture carver, Andre Brustolon, a student of Parodi, who set his imagination loose to create Italy’s most densely populated furniture. The greatest sculptor to work in Venice in the late 18th century was the neoclassical master, Antonio Canova, although he spent much of his career in Rome.